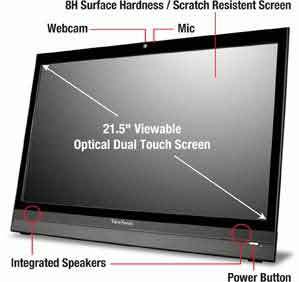 VSD220 22-Inch (21.5-Inch Vis) Smart Display with 1920×1080 Full HD resolution, features a TI Dual Core ARM Processor and Android Ice Cream Sandwich (4.0) OS. With full Google GMS certification, users can enjoy diverse Android multimedia applications such as social networking, cloud services, and online video. 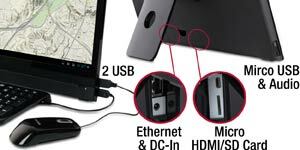 Versatile connectivity options include Micro HDMI, Three USB ports (2 x Type A and 1 x Micro USB OTG), Micro SD Card, RJ45, headphone jack, and 1.2M pixel webcam with integrated microphone for video conferencing. Wireless and Bluetooth network connections provide instant access to transfer data, documents, and multimedia files. In addition, the VSD220 can also operate as a traditional 22-Inch Full HD display via HDMI to your PC/Laptop for office work, or for surfing the internet and gaming. Integrated speakers with SRS premium sound complete the package for your multimedia enjoyment. PC-less computing is at your fingertips with the new ViewSonic smart display. Enjoy a terrific Android browsing experience on the high powered VSD220 21.5″ display with dual point optical touch. Google Play gives you full access to thousands of Android apps. Powered by TI’s multi-core OMAP processor, you’ll always have super responsiveness and amazing performance. So it’s fast and easy to connect with people on social media, watch movies and so much more. You won’t miss a moment of the action with your friends and family thanks to the 1.3 megapixel webcam with integrated microphone for video chatting. Stay in touch at your workplace with wireless and Bluetooth connections for instant access to email, data, documents, and multimedia. 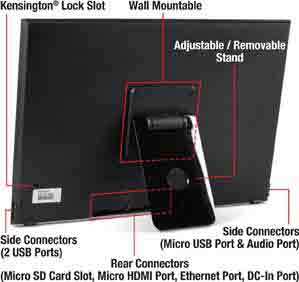 You can even use the VSD220 as a full HD touch monitor* for your laptop or PC, with the handy HDMI and USB ports. So go on: surf well, watch jitter-free video, game happily and explore apps to your heart’s content. Surf the web, access the cloud, in HD style Just like on your PC or notebook, you can access the web and cloud applications with the embedded web browser. Whether viewing your favorite news channels, checking your email, video chatting with friends and family, downloading new dinner recipes or just working on files through Google Docs, the VSD220 Smart Display is your perfect connected device to the internet. Always connected, wireless or ethernet You can stay connected with either Wireless or Ethernet connection, it’s your choice! Just plug in the VSD220 and turn it on and you are instantly connected. You’ll experience blazing access to web browsing, cloud based apps or streaming media . Get all your favorite apps on your VSD220 Smart Display! Explore hundreds of thousands of apps on the Google Play Store, and enjoy handpicked entertainment and productivity apps from ViewSonic’s own Appzone. Your Android world just got a whole lot bigger! Like, follow and connect with your friends and family through your social networks. Reply to email using the standard email apps or the embedded browser. Share photos, play YouTube videos or video chat with the integrated webcam. 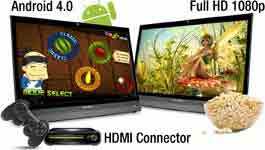 If you love Angry Birds on your cell phone, imaging playing on a generous 21.5” Full HD 1080p screen, with 5ms response time and integrated speakers. The VSD220 gives you the ultimate Android gaming experience. Turn the VSD220 into gaming monitor. Simply plug in your gaming console using the HDMI connector. The SRS 3D sound technology completes the package with outstanding stereo performance. A fast response time and Full HD resolution makes streaming HD media content and watching movies more exciting than ever. HDMI input also allows you to connect a Blu-ray player or set top box, and enjoy all your favorite movies or programs with the VSD220 Smart Display. Windows on Android, Yes! The VSD220 is Citrix certified which provides users secure, fast and convenient access to remote desktop and applications on their Citrix servers in a familiar Windows environment. This makes the VSD220 a perfect thin client device for Education, SMB and Enterprise customers. Citrix Receiver app is available for download on the VSD220 product page on ViewSonic.com and also Google Play. Getting started with your VSD220 Smart Display is as easy as plugging it in and turning it on. You can enjoy the touch interaction with the dual point optical touch or connect a USB keyboard and mouse if you prefer. You’ll find two full size USB ports along the right edge of the display. You can also connect your Bluetooth devices wirelessly for added convenience. The industry leading pixel performance guarantee and 3-year limited warranty, makes ViewSonic a market leader commitment to quality. ViewSonic is dedicated to using the highest grade panels and offers solid products you can count on. Corporate names & trademarks mentioned herein are the property of their respective companies. Copyright 2012 ViewSonic Corporation. All rights reserved.